Whatever the need in the development and execution of clinical trials, whether big or small, Polaris works with you to deliver faster results based on local evidence and international experience. 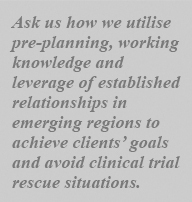 Thinking globally and acting locally, our Project Managers and Industry Specialists offer clients optimal clinical programme management through expert vendor selection and access to sites and patients in the emerging regions of Eastern Europe, India, Latin America and SE Asia. Polaris provides one point of contact for multiple regions or vendors. We deliver international clinical trial management from strategic input at protocol design and enhanced study feasibility through to full clinical programme development and delivery of evaluable data.